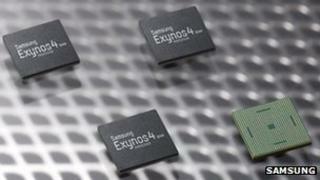 Samsung has said that the next version of its flagship smartphone will feature its new quad-core processor. The Exynos 4 Quad is based on a design by the British firm Arm Holdings and promises greater computing power and improved battery life . The new Galaxy phone is due to be unveiled in London on 3 May. Its current iteration, the Galaxy S2, has been the best-selling Android phone. Samsung said that other major handset makers were also "sampling" the chips. The South Korean firm said that the processor ran at speeds exceeding 1.4GHz per core, offering double the processing power while using 20% less energy than its dual-core predecessor, the Exynos 4 Dual. The advantage of having more cores is that the chip can carry out more calculations at once. Such parallel processing means upcoming handsets should be able to run video games with more complex graphics as well as being able to handle video editing apps at higher speeds. When the phone does not need to carry out such intensive tasks, some of the cores can be switched off or set to consume less electricity, in order to extend battery life. Samsung confirmed that the quad-core chip was exactly the same size as the dual-core version, meaning manufacturers could adopt it without needing to redesign their devices. The firm achieved this by using smaller transistors - the microscopic sized on/off switches at the heart of each core. "Given the diverse functionalities consumers are demanding from their mobile devices today, the Exynos 4 Quad meets those high-performance needs while keeping power consumption very low," said Samsung Electronic's Taehoon Kim. Last year Samsung sold close to one in every five smartphones. Although the firm did not provide a sales figure in its latest earnings report , based on its numbers analysts at Strategy Analytics suggested the firm sold 44.5 million smartphones over the first three months of the year, while IHS iSuppli estimated the figure was closer to 32 million. However, the firm's tablets have found less success. New statistics from analysts at Comscore suggest the Galaxy Tab family accounted for 15.4% of the total market share of Android tablets in the US in February. Its calculations were based on the number of unique devices accessing the web over the month and excluded use of the firm's smaller Galaxy Note tablet-phone hybrids. By contrast, Amazon's Kindle Fire accounted for a 54.4% share of the Android tablet market, according to the report. Both Amazon and Samsung's devices are outsold by Apple's iPad. The Cupertino-based firm said it sold 11.8 million tablets over the first three months of the year. Samsung did not provide a comparable figure when it released its results for the same period.